Colgan "D":Tully Yoakam (1), Nolan Higginbotham (76), Christian Cedeno (22), & Luke Marquardt (7). After a season-opening 41-35 loss to Salina South, Derby has played to an elite level many expected. The Panthers have moved back up to No. 1 in a 6A classification that has just two undefeated teams. In the last four contests, Derby has won by scores of 54-7, 62-13, 45-14 and 35-7. The Panthers put away last week’s game early with 14 first-quarter points and 21 in the second quarter. Derby is 1-1 at home and 3-0 on the road this season. Their 232 points ranks second in Class 6A, according to preppowerindex.com. The Hutchinson Salthawks continue to deal with injuries in what statistically is one of coach Randy Dreiling’s worst seasons. Hutchinson lost 48-10 to Salina South and suffered concussions to defensive back Josh Patterson and quarterback Turner Wintz, who was hurt on the Salthawks’ first drive. By the end of Friday’s contest, six starters were out with injuries. Salina South led 27-3 at halftime and was never threatened. Derby has lost 10 of its last 11 meetings against Hutchinson, including 31-28 in the regular season and 29-28 in sub-state last season in a pair of classics. The Panthers’ only win in that span was a 30-27 victory on Sept. 26, 2008. Derby gets another one here against a depleted Salthawk squad. Two of the top-ranked teams in the state will square off at Shawnee Mission North District Stadium as No. 2 Lawrence Free State travels to take on No. 3 Shawnee Mission East. SM East can claim the outright Sunflower League title with a victory in coach Dustin Delaney’s first year at the helm of the Lancers. SM East has won their last three games by a total of 12 points and needed some dramatic plays to remain unbeaten. In Week 3, Lancer quarterback Christian Blessen tossed a Hail Mary pass which was tipped and caught by Alec Dean resulting in a 27-22 win over Olathe Northwest. A week later, the Lancers scored a late safety and a touchdown to top Olathe North 23-22, and last week SM East recovered a fumble in overtime to hold on for a 27-21 win over SM South. SM East built a 21-7 lead last week only to see the Raiders tie the score with two fourth-quarter touchdowns and force overtime. SM East has primarily had success on the ground as one would expect from coach Delaney, who spent time as an assistant at Hutchinson before leading Emporia the last three seasons. Luke Taylor is the Lancer’s primary back with 679 rushing yards and five scores. Blessen has thrown for 485 yards and six touchdowns, but passed just twice in last week’s win over SM South. The Lancer defense is giving up just under 14 points per game and is led by Kyle Ball who has registered 54 tackles and three sacks. Free State will be trying to rebound from their first loss of the season. The Firebirds fell behind early to Olathe North thanks to Eagle running back Venus Triplett. All he did was rush for 221 yards and account for three touchdowns as North built a 26-7 lead on Free State. Joe Dineen and the Free State offense got in sync in the second half and pulled within 26-19 on a pass to Khadre Lane with a little more than a minute remaining. The Firebirds then recovered the onside kick which bounced off of a North player; however, Dineen’s pass was tipped and intercepted on the next play to seal the game for the Eagles. Free State will need an inspired effort from its defense if they are going to stop the SM East rushing attack. The Firebirds gave up 370 yards of total offense against Olathe North, including 250 on the ground. Dineen and Lucas Werner will have to continue to play well on that side of the ball. Last season, SM East entered this Week 6 match-up with Free State much like this one at 5-0, but the Firebirds handed the Lancers a 28-0 shutout loss. Bishop Carroll, Class 5A’s No. 1 team, struggled some in a 12-7 victory against Wichita Northwest last Friday. Colton Howell found Scott Linnebur for a 30-yard TD pass with 7 minutes, 34 seconds left. The play immediately followed a Northwest fumble at its own 30. Howell, who came on in the second quarter, finished with 109 total yards, including 67 rushing on 17 carries. Carroll moved its winning streak to 18 games and has yet to allow more than 14 points in any contest this season. Two weeks ago, Carroll delivered a 20-10 victory against Wichita West. Kapaun used four running backs in a 28-14 victory against Wichita East. The quartet of Devin Dempsey, Alexander Norris, Branden Williams and Ethan Harp combined for 26 carries for 175 yards. Quarterback Brock Monty led the team with 16 carries for 144 yards and also passed for 121 yards. Kapaun has outscored opponents 146-31, while Carroll has collectively beaten teams 183-43. They are two of the four undefeated Class 5A teams. Since 2004, Carroll has won the last nine in a row against Kapaun. However, three of the last five meetings are within eight points. Kapaun will keep it close, but Carroll is the clear best team in 5A. Ulysses lost in a high-scoring contest to offensive-minded Liberal in Week 1, but then bounced back with four consecutive victories. That included quality wins against Scott City and Goodland the last two weeks. 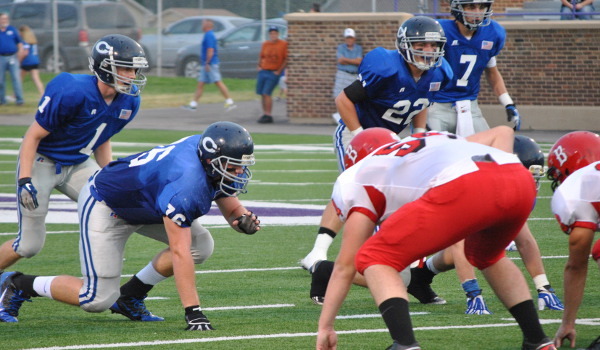 The win against Scott City ended a 40-game regular season winning streak for the Beavers. The Tigers finished with 669 rushing yards in a 75-34 victory against high-octane Goodland last week. Ian Rudzik finished with an incredible game: 26 carries, 467 yards and seven TDs. He scored on runs of 23, 38, 70, 67, 6, 77 and 63 yards. The sophomore already had 96 carries for 1,094 rushing yards with 15 scores. Last season, he finished with 1,187 rushing yards and 15 rushing TDs. He is currently fifth nationally in rushing yards for sophomores, according to preppowerindex.com. Holcomb defeated Colby 35-14 last week and kept the Eagles winless. Holcomb led 35-6 and had 230 yards of offense in the first half. Quarterback Heath Tucker had a big game with an 11-yard TD pass for the game’s first score and then an 86-yard run off a great fake for the second TD. Then, Tucker delivered a 37-yard punt return for the third score. Tucker finished with five carries for 75 yards and 3 of 3 passing for 64 yards before he sat out the second half. He has passed for 464 yards, rushed for 336 yards and accounted for 11 scores. Ulysses leads 3-2 in the last five games of the series. Holcomb won 35-25 last season. The Tigers’ rushing attack is on a roll. Tucker is a great all-around athlete, but Rudzik is playing at a high level. Expect plenty of points – and for Ulysses to take the GWAC title with a win. Two undefeated teams will meet in the CNC League for the second consecutive week as St. Mary’s Colgan visits Columbus. The Panthers and Titans are the only two remaining unbeaten teams in the CNC with the winner taking over the driver’s seat for the league championship. Columbus took a big step in that direction with an impressive 32-26 win at Galena (4-1) last week. Columbus built a 24-12 lead before Galena responded with a safety and two touchdown runs to lead 26-24. Trey Robinson, who stepped in when starting quarterback Nathan Bole left with an injury, scored from 1-yard out with 1:03 remaining to give the Titans the six-point win. Robinson completed 13 of 16 passes for 204 yards and two touchdowns in the game. Javohn Morill caught six passes for 132 yards and a score for the Columbus. The Titan offense is extremely talented with options like Zane Roark, Jace McDown, and Taylor Watkins in the backfield and Morril and A.J. Randall at receiver. If Bole is healthy, the Columbus offense is that much more dangerous as he’s rushed for more than 300 yards to go along with his near 500 yards passing. Columbus will be going up against another strong defense in Colgan. The Panthers have allowed only 22 points all season and eight of those points came against the junior varsity. Colgan is led on that side of the ball by senior linebacker Christian Cedeno and junior Austin Commons. That duo will be a key if Colgan is to slow the Titan rushing attack and force Columbus to the air. On offense, Colgan has relied on senior running back Drew Dawson to carry most of the load. Behind a young offensive line, Dawson has rushed for more than 100 yards in each of the past two games and scored three touchdowns. Senior quarterback Luke Marquardt has also shown the ability to make plays in the passing game. Colgan’s offense has benefitted from good field position thanks to a solid defense and special teams play. Kicker Aaron Twarog can be a weapon if necessary, having connected on a 38 and 45-yard field goal in the win over Frontenac. In what should be a great game, Columbus gets a slight edge at home. This matchup features Class 3A's No. 1 scoring offense (Beloit) and No. 2 scoring offense (SE of Saline) in a matchup that will likely decide the North Central Activities Association title. Southeast of Saline has averaged 138 passing yards and 273 rushing yards a game. Junior Cody Schlesener has completed 38 of 62 passes for 666 yards with a 10/2 TD/INT ratio. Senior Keith Short has 100 carries for 701 yards with 11 rushing TDs. Southeast ranks second to Beloit in scoring offense in the NCAA with 248 points; Beloit is at 280. Southeast of Saline has allowed just 26 points, best in the league. The Beloit Trojans have delivered 485 yards per game, while SE of Saline has 424 yards of offense. Southeast has already bettered last season’s 4-5 mark. Beloit has been challenged in two contests, including a 56-44 victory two weeks ago against Sacred Heart. Bowe Behymer has rushed for 757 yards and 14 scores, while quarterback Payton Vetter has rushed for 489 yards, passed for 369 yards and accounted for 12 TDs. This will be a very high-scoring game, but Beloit has the tradition and talent edge to pull off the victory.